Ed Moses, at 88, refuses to be tied down to any style or concept, rejects the idea of “the artist,” and creates by embracing the happy accident. Ed Moses, WC-C, 2014, acrylic on canvas, 60 x 48 inches. The small house in Venice, Calif., where Ed Moses lives is filled with his new paintings, spare diagonal grids of red and black. The extra bedroom has been turned into storage while out the back, lying on saw horses, are more paintings in progress. Moses, with a full beard and shaggy hair, shambles past that busy scene, with assistants bustling to and fro, and opens the door to a chapel-like space in his large studio building. With a devilish grin, he relishes the surprise that he is about to spring: Vertical panels of fun-house mirrors, eight feet tall and five feet wide, are dotted with teardrops of sprayed color. They are hung alongside his vertical monochrome paintings in black or yellow and another series of monochromes with cracked surfaces in blue and white. The colored monochrome paintings are wobbling and jarring in the mirrors, which also reflect the artist himself and the viewer. Like the renowned chapel in Houston for which Mark Rothko created a suite of transcendental paintings, this presentation by Moses is potent, intentional, and interrogatory. What exactly are we seeing? That is how he happened to come up with a new series of monochrome panels called “Craquelure.” After applying an solid undercoat of Nova color, often black, white or gold, Moses adds what he calls the “secret sauce,” an emulsion that causes the subsequent layer of paint to crack like dried clay. 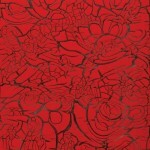 One day, he fell, causing his elbow to plunge into the canvas, which produced a rippling floral effect. Ever alert to the benefits of the happy accident, Moses started punching the surface of the rest of the canvas and saw arabesques erupting, lending a rococo air to the surface of the painting. To accommodate this discovery, he had thin nylon stretched over metal frames and then stretched canvas over that to withstand the punching that future paintings would receive. Mostly recently, a trio of monochrome crackled panels in black and white has been topped with an invisible track and wheels allowing a fourth panel of red to be moved back and forth in front of the others. It can be an ever-changing composition, a real “action painting,” says Moses slyly. While working on these pictures, he is also completing a series of diagonal patterns on canvas in reds and blacks that recall his grid paintings from decades earlier. 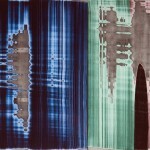 Inspired by Native American blankets, they are composed by laying rods coated in paint onto the wet surface of the canvas so that when they are removed, they leave a broken line as evidence. These and other series by Moses—falls of color applied with a large squeegee, looping compositions made with a sponge brush, patterns of figures sprayed on through stencils—are united only by the artist who has made them. Moses eschews allegiance to a single style and yet his paintings are quite identifiable as being his. Moses does not find it confusing to be occupied with so many different styles and methods of production. “I work on four or five things simultaneously,” he says and then explains the rather eccentric reasoning. Back in the early ’60s, when visiting Spain with his then-wife Alvilda Peters, their young son Cedd became alarmingly ill. The doctor treated him but it was touch and go. The doctor consoled Moses, “Don’t worry. You are still a young man. You can have more children.” Cedd survived (and has been an important developer in the revival of downtown Los Angeles). The Moses had another son, Andy, also an artist. But Moses applied the doctor’s advice to his other progeny, his art. “Before that, I used to work on one painting for a long period of time. After that, I started working on 10, 15 paintings at once,” he says. If one dies, chances are better that some will survive. Moses own survival is something of an ongoing saga. His mother got pregnant in Hawaii and while sailing to Long Beach gave birth to Moses in 1926. He was raised by his mother but spent summers with his father in Hawaii, where he became an avid surfer. In 1943, he enlisted in the Navy and was placed in the medical corps as a surgical assistant. After the war, thanks to the G.I. Bill, he enrolled in the pre-med program at Long Beach City College, where his grades were below average. He took one class with artist Pedro Miller. Moses knew nothing about any sort of art at that point. As his classmates were busy copying a still life, a desperate Moses slapped some brushstrokes of red and white on a canvas board. “That wasn’t any good, so out of desperation I put my fingers in the paint jars and scratched over the board,” he recalls. Miller looked carefully at Moses’ effort, picked up the canvas, and placed it on a ledge at the front of the class. Moses feared the worst. Instead, Miller proclaimed, “Now here’s a real artist.” Moses was stunned but pleased. “Changed my life right then and there. I became the hero of the class,” he says. Moses transferred to UCLA’s art department, and after several rambunctious detours into bohemian life—including a brief affair with Marilyn Monroe while he was working as a messenger at Twentieth-Century Fox—he settled down again in the art department of UCLA in 1953. There he met the brilliant young curator Walter Hopps, who co-founded the first contemporary art gallery in Los Angeles, Ferus. It was Hopps who talked to Moses about the abstract expressionists Willem De Kooning and Jackson Pollock, which gave him the courage to continue his own abstract paintings. They were shown at Ferus as he received his graduate degree in fine arts from UCLA. The following year, 1957, Moses moved to New York, where he befriended other abstract painters, especially Milton Resnick, at the Cedar Bar. 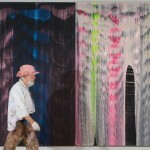 However, it was his connection to the original Ferus artists, especially Robert Irwin and Craig Kauffman, that made the most lasting impression. Those artists had moved away from abstract painting to pursue work that involved perception itself. When Moses moved back to Los Angeles in the early ’60s, he initially dedicated himself to large drawings of roses or patterns in silvery graphite. In 1970, at Mizuno Gallery, he had part of the ceiling removed and had rice husks tossed in the air to make the changing light substantively visible. His assistant was James Turrell, who was pursuing the act of perception as his own art form. It was a time of using alternative materials and focus on process. Moses came upon a technique that effectively melded those developments with abstract painting. Using tools he had picked up while working as a mechanical engineer in the 1950s, Moses employed a snap line to make thin rays of color on canvas. 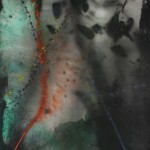 Then he flipped it over and poured resin onto the back, which embedded itself in the canvas. The translucent resin paintings seemed to contain light and color and were well received when shown in New York at Ronald Feldman Gallery and in L.A. at Nicholas Wilder Gallery. However, they were fragile and tended to chip around the outer edges, and the toxicity of working with the liquid resins was beginning to be understood by Moses, Kauffman, and their friends. The orientation to process and chance continued as Moses pursued the more traditional trajectory of painting. He continued to layer diagonal bands of color when he returned to painting in acrylic on canvas in the mid-’70s, until he realized he was painting band after band of the same color. 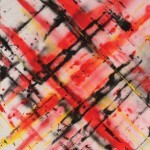 In 1975, he abandoned pattern for monochrome canvases for several years. Eventually, he melded both impulses into combinations of diagonally-oriented abstract panels with monochromes, often using red, black, and white. Throughout the ’80s, Moses painted diagonal bands of solid, translucent color—sometimes tidy, sometimes messy—on canvas or raw wood. The late ’80s and early ’90s saw him move away from geometry to more organic lines, creating wiggly, swirling, watery compositions. 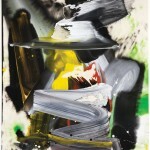 In the late ’90s, he applied broad swaths of color with a squeegee instead of a brush. In the first decade of the new century, Moses made work by soaking big sponges in whites and grays and jabbing them over a monochrome surface in random chunky blobs. Or he would cover the canvas in thin, calligraphic lines of white, black, or red, or else with thick, soft loops of earth tones. Then, around 2009, though never inclined to figuration, he did a series by stenciling profiles of laughing heads over backgrounds of stenciled lace or fabric. Throughout these years, Moses exhibited regularly, and in 1996, a retrospective was held at the Los Angeles Museum of Contemporary Art. Another retrospective, Cross-Section, organized by artist Kevin Appel and curator Juli Carson, is currently on view at the art gallery of the University of California, Irvine—where Moses taught in 1968—through December 13. The catalogue essay is being written by art historian Barbara Rose, who also taught at UC Irvine in the late ’60s.